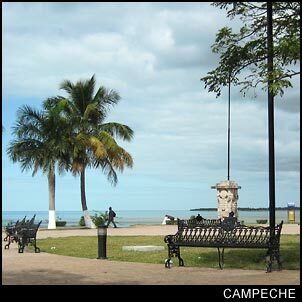 Campeche is a very nice Spanish colonial town located on the gulf coast. It isn't what anyone would call a tourist destination and knowing some Spanish is recommended. Most foreigners stopping in Campeche are coming or going on highway 180 between Merida and Villa Hermosa (on rout to Palenque). For those flying into Campeche, you won't be able to get a direct flight, but Aeromexico has flights from Mexico City. Much of Campeche's unique flavor comes from the fact that it had a long history of being attacked by pirates. This went on until the people were able to erect walls with bastions and two forts. The bastions and forts now house museums. The historic section with its Spanish colonial architecture has been beautifully restored. Electric and telephone lines have been routed under ground and the streets have been paved to look like cobble stones. In fact, they have done such a good job at restoring the historic district and the building facades that several movie companies chose the location for period films. Along with the flavor of the city, there are many ruins in the area that are definitely worth the trip. Don't forget to try a place that serves seafood while you are there. The location means that you will be able to find great dishes at very reasonable prices.